Known to be the “it beverage” recently, matcha, the ground powder from specially grown and processed green tea is driving the food world nuts. Popularly used to make the traditional green tea, lattes, smoothies and even as food flavoring, matcha is versatile as an ingredient and is rich in body boosting antioxidants. But could this traditional green tea powder make an amazing cocktail? 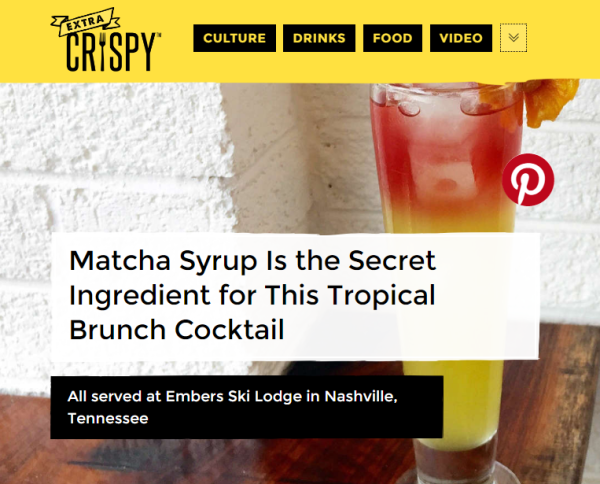 Read on as Extra Crispy, a new online destination devoted to breakfast and brunch reveals how Matcha Syrup Makes the Secret Ingredient for Embers Tropics on Ice Cocktail. Make the matcha syrup. Heat up water in a saucepan. Dissolve white sugar into hot water. Add matcha, and stir well. Once all the ingredients are fully dissolved, pour syrup separate container, and let cool. Make the cocktail. Add vodka, pineapple juice, and matcha syrup to a shaker with ice. Shake and strain over ice into a Collins glass. Add a splash of cranberry juice. Top off the glass with soda water. Garnish with a slice of dried pineapple. © www.embersskilodge.com | All Rights Reserved 2015.